Toronto has long been a major medical center. Sick Kids Hospital is perhaps the most famous. Built to an open plan, Sick Kids doesn’t feel like a hospital and the caregivers make kids comfortable and just as important, the kids’ parents. Then there is Toronto General Hospital which is arguably North America’s pre-eminent center for brain research. Princess Margaret Hospital is Canada’s cancer treatment center and Mount Sinai Hospital’s emergency ward is the place you want to go when you do something stupid. Starting in 2004 my hangout has been the Toronto Western Hospital’s Retina Clinic. It’s about 7 blocks north of me on Bathurst Street and houses the latest technology for detecting and treating eye diseases along with a crew of famous opthomologists including my man Mark Mandelcorn who was recently proclaimed Ontario’s Care Giver of the Year. Dr. Mandelcorn was a McGill University top graduate and along with his son Efrem whose practice is also in the Western clinic, is a leading member of Toronto’s retinal surgery community and faculty member at the University of Toronto. I first met Dr. Mandelcorn soon after The Case of the Disappearing Automobile. The day had begun as any normal day. The sky was clear and traffic sparse as my wife and I drove the four lane highway towards our home in Toronto. I was in the passenger’s seat when an automobile passed us on the left. As it pulled back into our lane well ahead of us, it vanished. There were no off ramps or pullovers for miles. “It’s your macular hole” Dr. Mandelcorn said. “I beg your pardon!”, came to mind, but I said nothing. One does not quibble with Dr. M., much less attempt double entendre. After sedating me, Dr. M. injected a bubble of gas into the back of my eye and told me to sit or lie face down every day for as long as possible. The weight of the gas would gradually close the macular hole. As the gas leached out, it appeared as a dark bubble floating in front of me, bobbing in space and growing ever smaller. When the gas was gone and the hole closed, Dr. Mandelcorn smoothed out the scar with a laser beam and removed some cataracts. Cataracts from my right eye were removed with ultrasound, the latest technology. Neat. I recall my grandmother’s experience with cataract surgery many years ago. It was successful, but she had to lie in bed on her back for 2 weeks with her head securely held in place by weights. In those days, cataracts were removed with a scalpel. I remember her eye glass lenses were very thick. How fortunate we are. After my hole was closed, the years following became an education in the vagaries of cataracts, vision scientists, Charles Bonnet Syndrome, neurology, MRIs, retinal hemorrhaging, field of vision tests, laser and ultrasound surgery And macular degeneration. There were many tests during the ensuing years. For some people, a needle injection is a simple matter. For me it’s a real pain in the arm. My veins are small, thus a pediatric needle is necessary when one plumbs for my blood. While waiting for test results, I’d watch people. Patients with vision problems tend to be elderly and carry elderly odors. Perfumes, colognes, old clothes and strong tobacco scents join the normal hospital smells to create if you will, an olfactory potpourri. A woman came out of the bathroom and as she began rummaging about in her purse, launched a brief sotto voce fart. She didn’t seem to notice, nor did anyone else. Just another ingredient in an already complex recipe. Last week, I brought the latest test results to Dr. Mandelcorn. He told me he would inject something into my eye, but I never really thought about it until I saw a syringe and needle on a white table next to me. The eyeball and razor scene in Louis Buñuel’s film un Chien Andalou (1929) came to mind. An assistant anaesthetized my eye and Mandelcorn administered drops of iodine, which he pronounced iodeen. I commented on his pronunciation of iodine and he abruptly said, “Don’t talk”. At that I chuckled and he said,”Don’t laugh.” And then, as if to teach me a lesson, he leaned over and slowly brought the needle ever closer to my eyeball. After a small jab, Dr. M. finished injecting the Lucentis and was finished, as was I. About one in1000 patients experience infections after having this procedure. His commands to not talk or laugh were not meant to be impolite, but rather to keep me from further polluting the air in the room. I told him he was perfect and I took no offense. That’s not exactly what I meant to say but he smiled and said he’d see me in 6 weeks. By the way, I have wet macular degeneration in the right eye and dry macular in the left eye. At this time dry macular cannot be cured, but mine is progressing very slowly and time might be in my favour. The wet macular may be impeded, even eliminated with periodic injections. The reader can look up Charles Bonnet Syndrome. It’s really quite interesting and for some reason, most prevalent in Australia! For a few years I’ve been happy to tell people that I had Charles Bonnet Syndrome. It’s a great conversation starter, but alas I no longer have it. My problem has been bright pinwheels in the center of both eyes. These are caused by a malfunctioning nerve. They never go away and I can no longer drive an automobile or read a book. I cannot identify people until I’m almost on top of them. This can be a good thing. It’s handy during the annual Percussive Arts Society International Conventions where a lot of people know me, but my lousy memory prevents me from remembering their names. I’ve tried to get the word out that I have vision problems and that’s beginning to take care of the situation. Now people will say, “Hi Robin, it’s Bill”. I no longer have to pretend knowning their names as I try sneaking a peek at their name tags. Anyway, that gambit never worked. 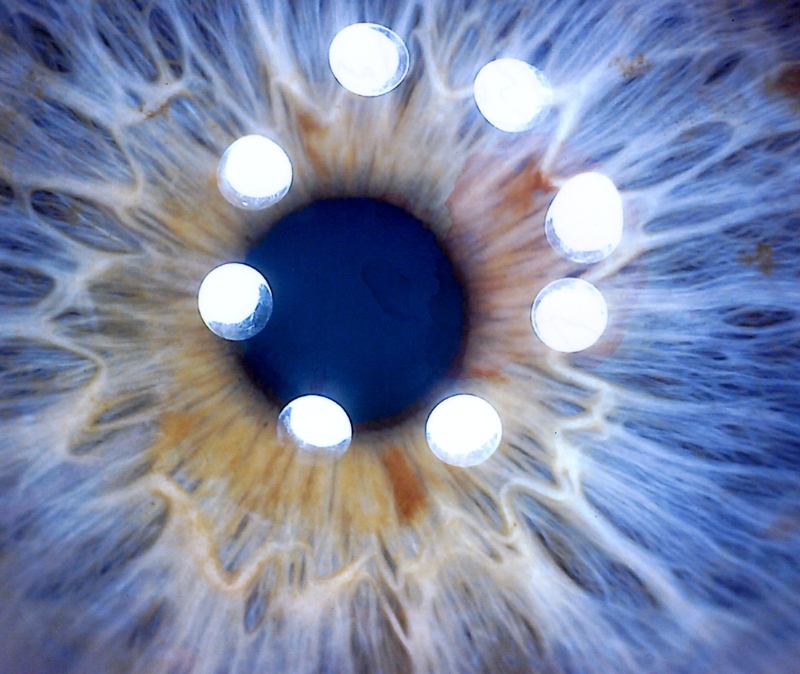 A human eye projected on a computer screen by the Hawk USB Digital Microscope. The white circles are the microscope’s lights. Image by Bryce Engelman.